Alice and Jack Lessels were both born in Scotland. After emigrating separately to Canada, (Jack with his brother, Harry) they met and were married in Toronto. Jack had been working as a groundskeeper on the Dunnikier estate in Kirkcaldy, on the east coast of Scotland so he had good experience to work as head groundskeeper for Gordon and Kathleen Lefebvre on their Holyrood Estate at the foot of Dorval Drive in Oakville, Ontario in 1929. Alice had been working in Edinburgh before emigrating in the 1920's. 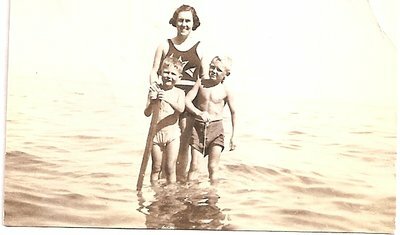 Alice is pictured here with her sons Roy and Alistair in Lake Ontario in front of the Holyrood Estate. In 1930, Roy had been born in the estate house. As he tells the story, "...when I was to be born...Mrs. Lefebvre said, Alice, that was Mom, we have a spare bedroom in the main house, it’ll be more comfortable to give birth in there and that’s how come I came to be born in Holyrood House." At the time, his parents lived in the apartment over the 3 car garage. "Soon afterwards, Gordon Lefebvre built a brand-new groundskeeper's cottage on approximately 5 acres behind the cemetery." The Lefebvres were often away and the Lessels family had a standing invitation to use the tennis courts, swimming pool and other property amenities. Information and photographs of Holyrood house, the Lefebvre family and the history of the property in the Trafalgar Township Historical Society digital collection were shared by Mr. Roy Lessels in May 2016. Roy's father was the head grounds keeper for the estate from 1929 to 1945, in the employ of Gordon Lefebvre who was head of the Pontiac Division, General Motor Company, and again from 1955-1969 for David Knapp. The images with notes remain the property of Mr. Lessels. The "Groups of Related Records" link will take you to the other records, maps of the property and photographs of the estate people in Mr. Lessels photo album. Alice Lessels, d.age 99, 11 months, 14 days, married John (called Jack) Lessels, b.1902, d.March 5, 1986, age 84. Son John Roy (called Roy), b. February 13, 1930, married Joyce. (He worked for Rubbermaid for many years, Joyce worked for Oakville dentist, John McLennan.) Son Alistair Anderson, b.January 27, 1932 (in Edinburgh, Scotland), married Diane Hammer in March 1964, d.July 29, 2014. (He had a real estate brokerage in Collingwood.) Harry, brother of Jack Lessels, d.August 19, 1990.